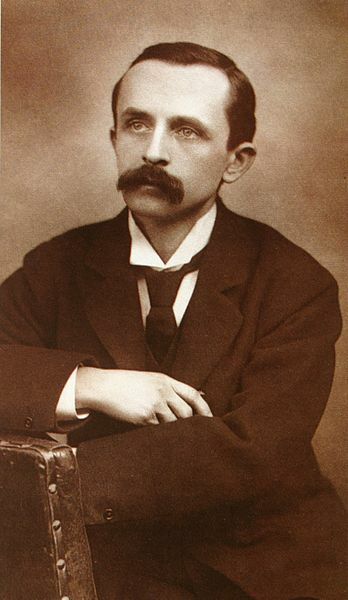 Scottish author and dramatist, James M. Barrie, born in 1860, was best remembered for creating the beloved Peter Pan. Raised in a family of country weavers, Barrie finishing his education in Scotland, then moved to London to develop his career as a novelist and playwright. It is there he befriended and was inspired by the Llewelyn Davies boys, to write about a baby boy who never grew up in Neverland, a "fairy play" which included the unusually named heroin, Wendy. Peter Pan quickly grew acclaim as a play in 1904, followed by Barrie's novel, Peter Pan; or, The Boy Who Wouldn't Grow Up in 1911. It's a shame that his lesser known short stories, such as The Inconsiderate Waiter (1920), and the The Courting of T'Nowhead's Bell do no not get more recognition. They are far deeper, darker, more cynical views of adulthood and more humorous than his land of Neverland. Barrie unofficially adopted the Llewelyn Davies boys after their parents' death. He gave the rights to his Peter Pan works to London's Great Ormond Street Hospital before his death in 1937. The hospital continues to benefit from this generous gift.